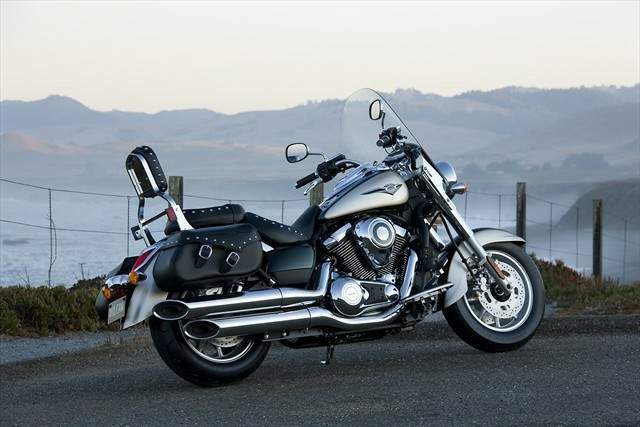 Kawasaki’s new 2009 Vulcan® 1700 Classic LT is the motorcycle you seek. Building on the innovative Vulcan 1700 Classic, the LT adds just the right amount of accoutrements – a large windshield, leather saddlebags and a backrest – to make any solo or two-up venture around town or on the highway blissful. The striking, top-grain, reinforced cowhide saddlebags are the core of the Classic LT’s touring package. The leather is carefully selected to minimize flaws and deep-dyed to prevent scraping off the finish. These ideally-sized bags feature a slant-top opening held shut by two 1.5-inch wide leather straps fitted with chrome buckles and stealth quick-release fasteners. Rolled and riveted lid tops along with metal reinforced upper edges on the bags help maintain shape and keep unwanted moisture out of the bags. Comfortable seats for the rider and passenger are a must on a cruiser able to tackle anything from daily commuting to daytrips with a partner. The Classic LT has the seats along with a classic-style backrest to keep the passenger relaxed and smiling as the miles tick by. Detailed with chrome plated brass studs to match the bags, the classically styled seat and backrest blend attractive visual appearance with comfort. A large, optically correct, acrylic plastic windshield rounds out the 1700 Classic LT additions. It offers adjustable height and delivers serious wind protection and smooth airflow around the rider and passenger. Its lighter, more compact frame holds a newly designed 1700cc engine based on that of the mighty Vulcan 2000. However, it uses a SOHC rather than push-rod actuated OHV arrangement. This permits fast revving and quick acceleration from the 1700cc engine – delivering superior passing performance at highway speeds. The new engine’s increase in compression, displacement and long-stroke design means significant torque and power gains over its predecessor. On the technology leading edge, Kawasaki’s first fully electronic throttle valve system makes its debut on the new Vulcan 1700. Together with the fuel injection system, the electronic throttle valve offers smooth, natural engine response by enabling the ECU to deliver an ultra-precise metering of both fuel and air to the engine. It also provides accurate cold-engine idling speed control, reduces rider fatigue and retains the “natural” throttle feel. More cutting edge technology is found on the Classic LT’s fuel injection system. Like the systems in use on Kawasaki’s Ninja® 650R and Vulcan 900 motorcycles, the 1700’s FI utilizes one sensor in place of the usual three, for less complexity and weight. Besides the obvious advantages of FI like improved fuel economy, the system permits easy hands-off starting. The Classic LT features FI and exhaust tuning to deliver the peak torque and horsepower at lower rpm – ideal for the urban and back road environments, and quick acceleration to highway speeds. The Vulcan 1700 Classic LT also features a water-cooled alternator with rare-earth metals that produces a staggering 48.5 amps of electrical output; plenty to power navigation systems and other electrical accessories that enrich modern touring. Moving the tourer down the road is a new six-speed transmission featuring overdrive and super strong carbon fiber drive belt. The sixth gear functions as an overdrive gear, contributing to relaxed riding and better fuel economy at highway speeds. The new carbon fiber drive belt has a 40-percent higher tensile strength than current Kevlar units, and allows the Vulcan 1700 to use a thin and light 28mm belt. However, this is no cold, mechanical techno-marvel. 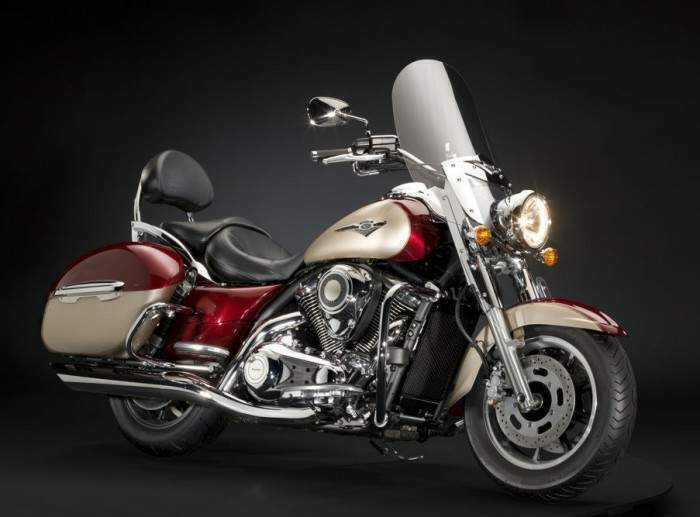 The designers were able to infuse the abundant technology into the new Vulcan 1700 Classic LT with all the charm and visual appeal expected on a Kawasaki light touring cruiser. Meticulous attention to detail and exquisite craftsmanship of the engine covers, bodywork design and saddlebags result in an eye-pleasing product that turns heads whether parked in front of a café or cruising down the highway. 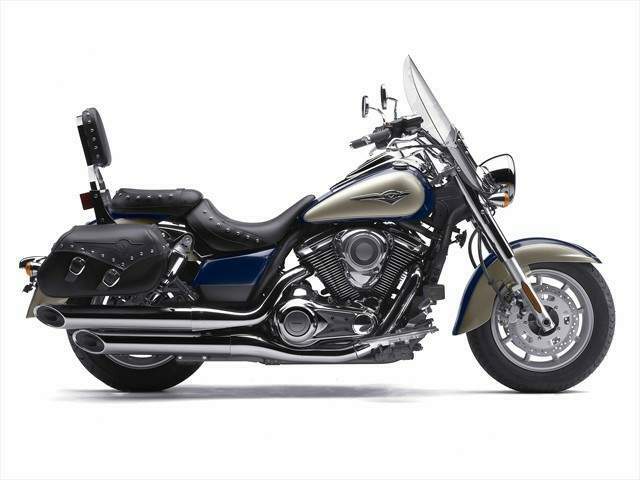 Adding to the light and easy handling of the low weight chassis design are the new suspension components – set to match the Vulcan 1700 Classic LT’s cruiser performance. A simple but elegant rear steel tube swingarm suspension with twin air-assisted shocks provides 3.1 inches of travel, and includes air adjustable spring preload and rebound adjustment. Up front, a large 43mm fork offers precise steering feedback, four-way preload adjustment and 5.5 inches of travel. The Classic LT rolls on new nine-spoke cast wheels, which use tubeless tires and complement its new muscular styling. Mounted on the attractive wheels are a 130/90 front radial tire and a wide, 170/70 rear radial tire. These aren’t the giant size tires that can "dull" handling, but beefy treads that offer good traction, smooth ride and good style. Dual 300mm front disc brakes with twin-piston calipers and a single 300mm rear disc brake with a two-piston caliper bring this show to smooth, powerful stops. A stylish combination of traditional styling, sophisticated technology and touring accessories, the Kawasaki Vulcan 1700 Classic LT is ready for your daily commute or a day trip departure. - Twisting the throttle turns a throttle pulley on the throttle body actuating the Accelerator Position Sensor (APS), located on the throttle body, to send a signal to the ECU, which then actuates the throttle valves via a DC motor. Throttle position is confirmed to the ECU by Throttle Position Sensor (TPS) APS and TPS send two sets of signals to the ECU for system redundancy in the unlikely event of a sensor failure.